At the February 10, 2014 Union School District Board Meeting, the Board approved the option of Dual Enrollment Zones. 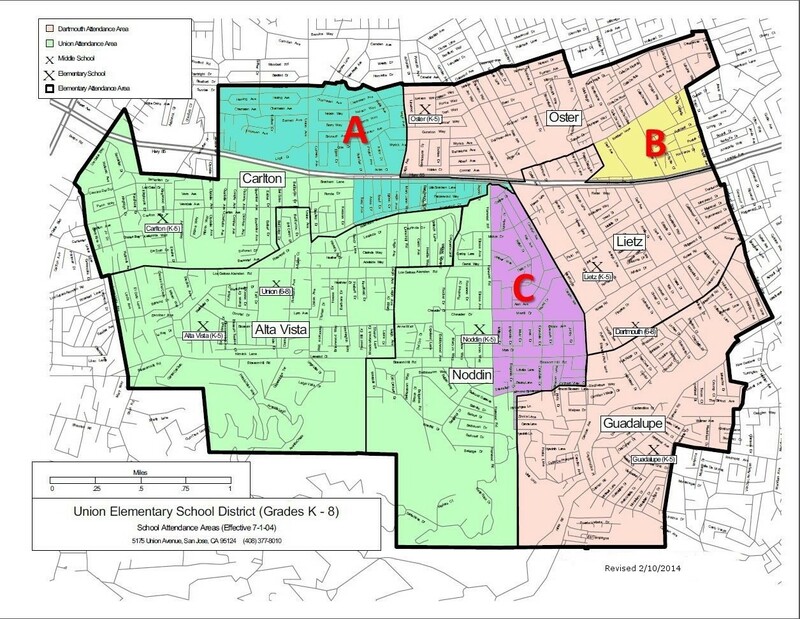 The goal of these zones is to allow parents to have more choice in their child's attendance area, balance the sites' sizes, and allow students to attend sites closer to their homes without changing school boundaries. To view the Dual Enrollment Zones, click on the map above. If a school fills to capacity, a zone may be closed and parents will be notified at that time. Choosing a school in a dual zone only needs to be done once and that becomes the student's home school. If you live in Zone A, you may choose to enroll your child in Carlton or Oster for Elementary School and Union or Dartmouth for Middle School . If you live in Zone A, but your child has never attended a school in the Union School District, you may register online for your chosen school and then bring proofs of residence to that school. If you live in Zone A and your child is attending a school in the Union School District, you should print, complete, sign and return the Dual Enrollment Zone application to your current site, so that the information can be forwarded to your new site for the 2016-17 school year. Please note that for Zone A, Carlton is now closed for all new student enrollments K-4th grade (2016-17). Parents may enroll at their home school and work with the staff on another placement within the District. For 2016-17, Union Middle School is closed and parents should register and bring proofs of residence to Dartmouth Middle School. If you live in Zone B, you may choose to enroll your child in Oster or Lietz for Elementary School . If you live in Zone B, and your child has never attended a school in the Union School District, you may register online for your chosen school and then bring proofs of residence to that school. If you live in Zone B and your child is attending a school in the Union School District, you should, print, complete, sign and return the Dual Enrollment Zone application to your current site, so that the information can be forwarded to your new site for the 2016-17 school year. If you live in Zone C, you may choose to enroll your child in Noddin or Lietz for Elementary, and Union or Dartmouth for Middle School . If you live in Zone C, and your child has never attended a school in the Union School District, you may register online for your chosen school and then bring proofs of residence to that school. If you live in Zone C and your child is attending a school in the Union School District, you should, print, complete, sign and return the Dual Enrollment Zone Application to your current site, so that the information can be forwarded to your new site for the 2016-17 school year. If schools fill to capacity, a zone may be closed. Please note that for Zone C, Union Middle School is now closed for all new student enrollments 6-8th grade (2016-17). All new middle school enrollments in Zone C will register for Dartmouth Middle School. Choosing a school in your zone only needs to be done once and that becomes a student's home school.